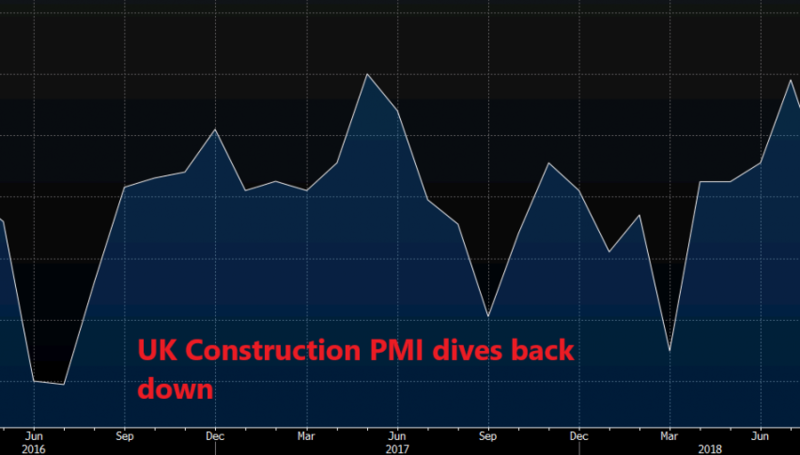 The UK construction output took a bearish dive today after having posted a surprising jump last month. In August, the construction PMI came at 55.8 points when it was expected to come at 552.8 points. So, last month’s number was a positive surprise and it gave some support to the GBP. Today, the construction PMI was expected at 54.9 PMI points, but it came at 52.9 points which is a two full points’ miss. This takes the construction sector to its normal trend of the last several months. Although, the risk here is that construction might dive back below the 50 level, which would mean contraction. We saw this indicator fall below the 50 level a couple of times late last year and in April this year. So, there’s a real possibility that it happens again, especially with Brexit looming over our heads. The construction sector is not the biggest sector of the economy since services make up for around 4/5ths of the total economic activity in the UK. But construction is a leading indicator of the economy and after yesterday’s miss in the manufacturing data, this is another negative sign. Anyway, I would have expected the GBP to take a dive as well on today’s construction numbers but it held up pretty well. GBP/USD is sliding but it is coming from the USD side since the Dollar is gaining across the board.